Home Tips & Advice How To Trim Your Dog’s Nails? How To Trim Your Dog’s Nails? Unless your pet is a very active outdoor dog his nails will need to be trimmed on a regular basis – anywhere from once a week to once a month. Nail trimming is an activity that is often feared by both dogs and owners. The best way to calm your fears is to ask your Vet or a professional groomer to train you in the proper techniques for nail trimming. The best way to calm your dog’s fears is to train it from a very young age to be comfortable with the process. If you don’t feel comfortable trimming your dog’s nails your vet or groomer will be happy to do this regularly. And often dogs do not need their nails trimmed if they go for frequent walks on footpaths or concrete. Just watch those dew claws (thumbs). There are two kinds of nail clippers: a guillotine type and a scissors type. The guillotine trimmer has a stationary hole where the nail goes through and a blade that moves up to cut the nail when you squeeze the handles of the trimmer. The scissors type works just like a pair of scissors. You open them and put the tip of your dog’s nail between the blades to trim it. Visit a pet store to look at both styles of trimmers and then choose whichever you feel most comfortable with. If you’ve never trimmed your dog’s nails before, spend a few days getting him used to having his feet handled first. Pick up one of your dog’s paws and gently touch his toes and nails for a few seconds. Release his paw and immediately give him something delicious, like a small piece of cheese or chicken. Repeat steps one and two for a couple of minutes. Immediately feed your dog a treat. Repeat steps four and five for several minutes. After another day or two of practicing steps 4 to 6, as long as your dog still seems relaxed when you handle his paws, try trimming a nail or two. Start your nail-trimming session when your dog is sleepy or well-exercised. Remember to give your dog a tasty treat after trimming each nail. Get some treats and your clippers, and take your dog to a quiet area. Keep a clotting powder, such as Kwik Stop® Styptic Powder, close at hand when you trim your dog’s nails so that you can quickly stop the bleeding if you accidentally cut the quick. Choose a nail to trim. Take your dog’s toe and hold it firmly but gently between your fingers. If you’re using a scissors-type trimmer, hold them at a right angle to the nail with the tip of the nail between the blades. Quickly squeeze the handles to close the scissors and cut the nail. If you’re using a guillotine-type trimmer, insert the tip of your dog’s nail into the hole, holding the trimmer perpendicular to the nail so that you cut from top to bottom, not side to side. To be absolutely sure of where you’re cutting, you can face the cutting blade toward you rather than your dog. To produce a cleaner cut, you can face the cutting blade toward your dog, but you won’t be able to see exactly where the blade will make contact with the nail. Choose whichever orientation makes you most comfortable. 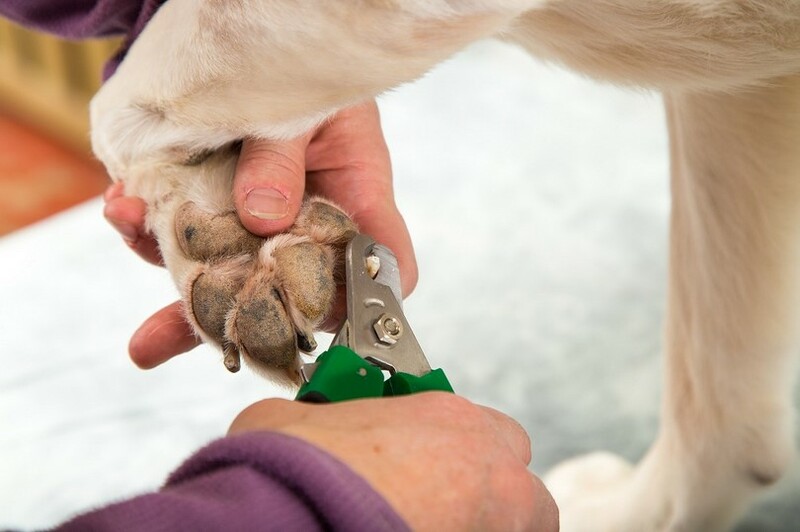 When you’ve positioned the trimmer in the right place, squeeze the handles to cut through your dog’s nail. Knowing where to trim a nail takes some skill. If your dog has clear nails, you can see the live quick, which looks pink. Cut the nail no closer than about two millimeters from the quick. If your dog has dark nails, you can avoid cutting into the quick by trimming one little sliver of nail at a time, starting with the tip. As you cut slices off your dog’s nail, look at the exposed edge of the cut nail. Eventually, you’ll see a gray or pink oval starting to appear. Stop trimming when you see the oval. If you don’t, you’ll cut into the quick, causing pain and bleeding. Another option with black nails is to have an assistant use a flashlight to back-light each of your dog’s nails while you trim. The light from behind the nail allows you to clearly see the pink quick. Don’t forget to trim your dog’s dewclaws as well. Most dogs just have dewclaws on their front legs, but some dogs have one, and sometimes even two, sets of dewclaws on their rear legs. If your dog doesn’t have dewclaws on his front legs, he had them surgically removed earlier in his life. As long as your dog doesn’t seem upset when you trim a nail or two, you can continue to trim nails over the next few days until you’ve trimmed them all. Trim two or three at a time, always delivering a treat after trimming each nail. The next time your dog’s nails need trimming, you can try trimming more nails per sitting. Eventually, you’ll be able to trim all of his nails at one time. To make sure your dog continues to feel comfortable with nail trimming, keep delivering treats during and right after trimming time.